The small unit means you don’t have to sacrifice much space. The benefits you gain are worth giving it a try. Let’s review this revolutionary device. Induction cooking creates heat in a much different way than traditional stoves. Instead of a coil heating up, induction heating is a magnetic reaction. When cookware—you have to use the correct type—touches the induction cooktop, an electrical current is created. This is possible because the cooktop is an actual electromagnet. This allows heat to be generated between these two objects. You can see that heat can’t easily escape since it’s only present where the units touch. This also means cooking becomes safer since the induction cooktop’s surface is usually less hot than traditional stoves’ elements. When you consider using new products, you’ll get the most satisfaction if you understand them well. Here’s what you need to know about the Waring Pro ICT200 portable induction cooktop. Even though this product is safe, you must ensure you use it correctly. 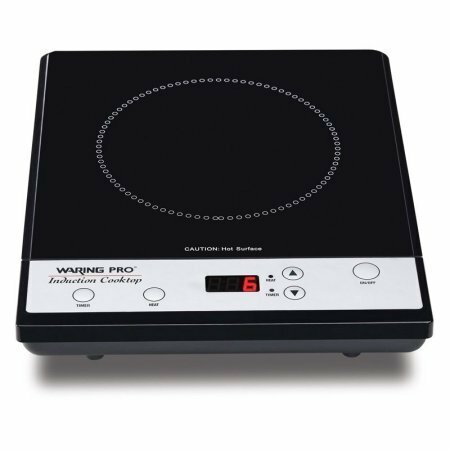 The Waring Pro ICT200 portable induction cooktop requires a 120V power source. These are present in most homes but double check before you start using your new cooking feature. Before you purchase this you must ensure it fits in your kitchen otherwise it will be a burden instead of a benefit. Maximum cooking area is less than 8”. This is ineffective for large dishes or high volumes of food. Adjusting to a new method of cooking can cause frustration. Waring helps you handle much of these problems by offering you user-friendly products. The Waring Pro ICT200 portable induction cooktop even includes a magnet so you can easily test which of your current cookware is induction ready. Are you ready to enjoy a new, better and revolutionary way of cooking? Time because you don’t have to wait for an element to heat up. It happens almost instantly when the cookware touches the surface of the unit.